Marten Spars make masts and booms for some of the most important shipyards, focusing their efforts on the constant development of production, in order to be able to offer their customers the latest state-of-the-art equipment. 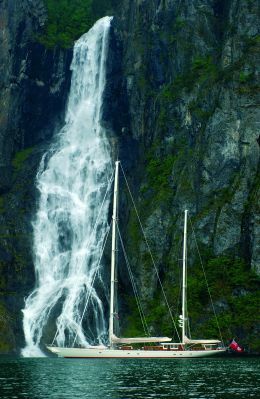 Despite being a rather young enterprise, established in the late 1980s, New Zealander Marten Spars have earned an excellent reputation among the main builders of sailing yachts. One of the main reasons is to be found in the company's investments in their development of equipment and upgrading of production methods, thanks to which they were also able to obtain the Quality Certification ISO9001. The history of Marten Spars began in 1988, when they provided the carbon fibre equipment for the K-Boat, which at the time was the New Zealand America's Cup challenger. That date marked the beginning of their path as experts in the making of carbon fibre equipment. Thanks to their modern production techniques, the results in the treatment of carbon fibre are of a very high standard, both in terms of weight and of structural strength. Marten Spars masts consist of two carbon prepreg shells, which are made by means of a female mould, and are then heated in an autoclave. The treatment using a female mould delivers a superior, very compact, laminate with an excellent surface quality; moreover, it allows inspection of both sides of the laminate, so that its quality can be tested before being subject to any mechanical stress. As well as masts, Marten Spars make booms with a roller-based furling system, a technology which helps reducing the surface of the mainsail, or furling it, especially on board of modern boats, these being now designed to be served by a skeleton crew. Moreover, as a joint venture with Future Fibres, Marten Spars also manufactures FibreFoil, a special fibre shroud rigging; when employed, FibreFoil grants both aerodynamic and aesthetic advantages. Among the several customers which have trusted Marten Spars products, we can find Vitters Sipyard, which have chosen the New Zealander company to equip their "Adele", a 174' ketch designed in collaboration with Hoek Naval Architects; the 1'82' "Sarita" by Oyster Yachts; and also the 38m Dixon and the 22m Reichel Pugh, to be built soon. For further information: Marten Spars; PO Box 38484; Howick; Auckland, New Zealand; tel. +64 9 5763573; fax +64 9 5762150; website www.martenspars.com; e-mail office@martenspars.com.